A conservative group filed a 21-count Federal Election Commission complaint Wednesday against Rep. Alexandria Ocasio-Cortez alleging that her unreported arrangement with the Justice Democrats PAC violated campaign finance laws. The Daily Caller News Foundation first reported that Ocasio-Cortez and her chief of staff held legal control over the political action committee at the same time it was supporting her campaign. The Coolidge Reagan Foundation’s FEC complaint is the third filed against Ocasio-Cortez in the past five weeks. A conservative group filed a 21-count Federal Election Commission (FEC) complaint against Rep. Alexandria Ocasio-Cortez Wednesday alleging that her unreported affiliation with Justice Democrats PAC during her 2018 primary campaign violated campaign finance laws. The New York Democrat and her chief of staff, Saikat Chakrabarti, held legal control over Justice Democrats at the same time the political action committee was playing a key role in supporting her campaign, The Daily Caller News Foundation revealed in March. Ocasio-Cortez and Chakrabarti “engaged in a brazen scheme involving multiple political and commercial entities under their control to violate federal election law, circumvent federal contribution limits and reporting requirements, and execute an unlawful subsidy scheme,” the Coolidge Reagan Foundation’s complaint states. The complaint cites TheDCNF’s report in its complaint and alleges that Ocasio-Cortez, her campaign and Justice Democrats violated the law by failing to report their affiliation to the FEC. “If the facts as alleged are true, and a candidate had control over a PAC that was working to get that candidate elected, then that candidate is potentially in very big trouble and may have engaged in multiple violations of federal campaign finance law, including receiving excessive contributions,” former Republican FEC commissioner Hans von Spakovsky previously told TheDCNF. Justice Democrats stated on its website from December 2017 until two weeks after Ocasio-Cortez’s June 2018 primary victory that she and Chakrabarti held “legal control over” the PAC, and corporate filings obtained by TheDCNF show that the two served on its three-member board during her primary campaign. 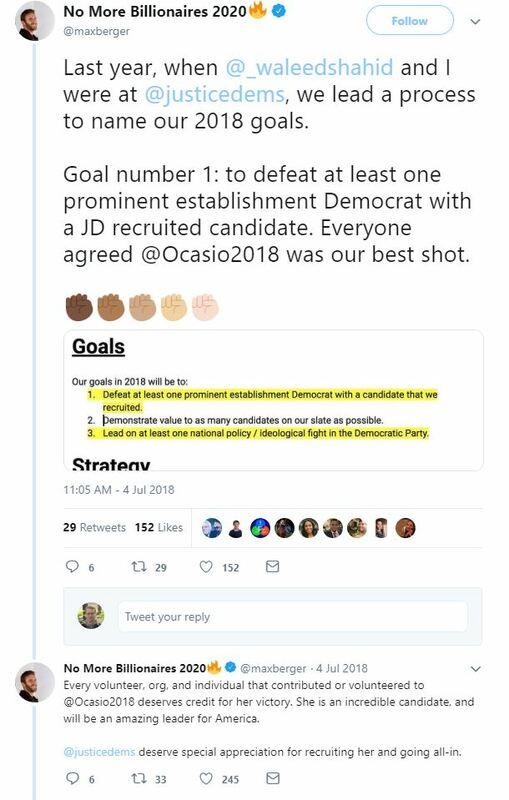 Former Justice Democrats staffer Max Berger tweeted after Ocasio-Cortez’s primary victory over incumbent Democratic Rep. Joe Crowley that the PAC decided in 2017 to go “all-in” on supporting her campaign. The tweet was deleted sometime after it was included in a DCNF story. Justice Democrats confirmed to the New York Daily News in March that Ocasio-Cortez resigned from Justice Democrats’ board on June 30, 2018 — four days after her shock primary victory. Former FEC chairman Brad Smith said Justice Democrats’ acknowledgment that Ocasio-Cortez was on the PAC’s board while it was supporting her primary campaign makes an investigation practically unavoidable. It’s unclear why Ocasio-Cortez was granted a seat on the board of Justice Democrats in December 2017. Numerous inquiries to Justice Democrats and Ocasio-Cortez’s office have gone unanswered. Former FEC commissioner Lee Goodman explained on Fox Business in March that the Justice Democrats and Brand New Congress “enterprise” appears to have given a multi-million dollar subsidy to Ocasio-Cortez and the other political campaigns it supported. “The enterprise of two political action committees and an LLC provided campaign support at a deficit — that is they spent about $3.3 million to support the campaigns of the congresswoman and others, and yet they charged the campaigns only about $300,000, and I think that looks like a potential $3 million subsidy to the campaigns they supported including the congresswoman’s because she paid only $60,000 for the service she received from this enterprise,” Goodman, a Republican, said. Ocasio-Cortez and Justice Democrats did not respond to a request for comment.